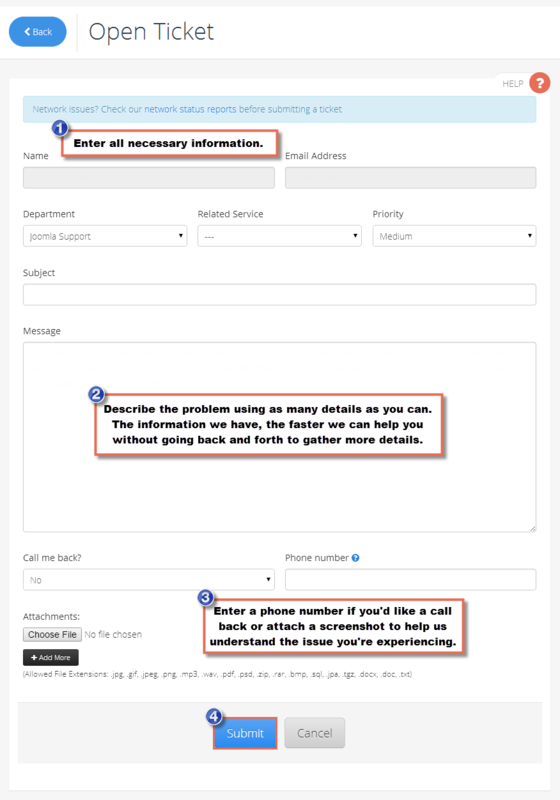 Submitting a support ticket to our industry leading support team is an easy process. Watch the video or read the article below to learn how to get hosting help or help with your Joomla or WordPress application. We ask our customers to follow some simple rules to make our support system run smoothly. New clients sometimes submit a support ticket with several issues listed, and we’ll commonly remind them of these rules. We love to solve your issues, but we need your help in keeping this system organized and efficient. 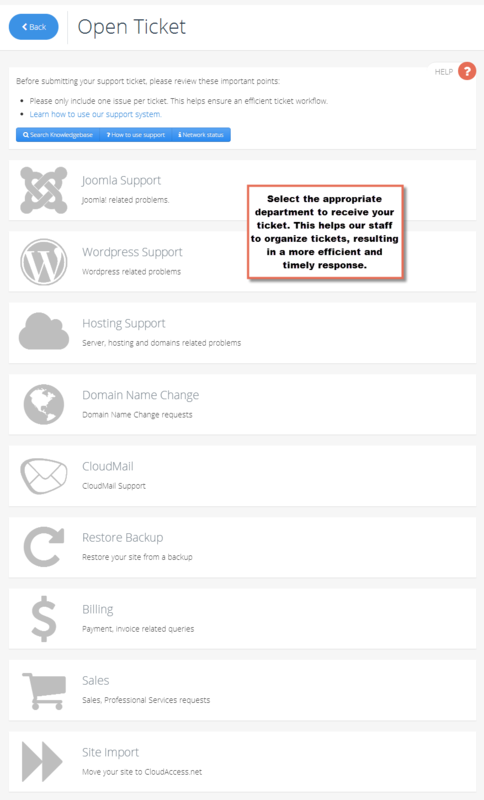 To submit a support ticket, log into the CloudAccess.net Cloud Control Panel™(CCP), click on the "New Ticket" button. Select the appropriate department to receive your ticket. This helps our staff to organize support tickets, resulting in a more efficient and timely response. The information that you may be asked to provide will vary by department as detailed below. Remember that it is always useful to be able to see things as you see them, so submitting a screenshot with your ticket can be very helpful. Also, If your site is completely down, please read our Network Report first. If it's a server-wide issue, we are already fixing the issue, and there's no need for you to submit a ticket. We will make sure your site gets back online as soon as possible. Tickets with priority "Waiting for Reply" will be held in the system for up to 7 days before the ticket is closed. We will assume since the ticket was not responded to that the issue has been resolved. If assistance is still needed, our clients can reopen or create a new ticket.